The above photograph shows Dr Bruce Cooper, a retired GP from Preston, Lancashire duruing a visit to the WW2 Tunnels in Gibraltar. 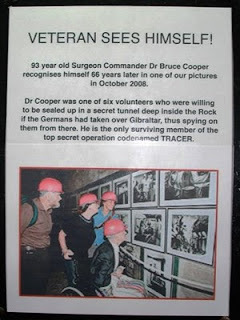 During WW2 Dr Cooper was part of a team who were ready to be sealed inside the 'Rock' in the event of the Axis Forces launching a successful attack to occupy Gibraltar. This was Dr Cooper's first visit back to Gibraltar in many years. 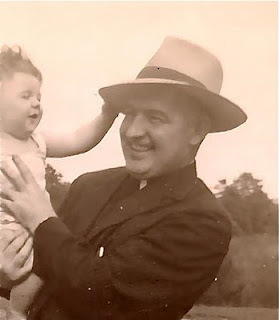 At this time, in October 2008 he was 93 years old and the last surviving member of the team who were prepared to be sealed inside the tunnels with the intention of sending messages back to the Allies by wireless signal. 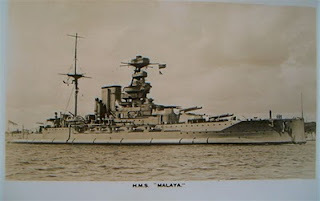 HMS Malaya was a Royal Navy Queen Elizabeth Class Battleship launched in 1915, and saw action in both World Wars. It was scrapped after WW2 in 1948. Its bell is on display at the East India Club, London. I obtained the postcard photograph seen above in Gibraltar on behalf of Mr James ('Jimmy') Campbell of Whitehaven, Cumbria who served on HMS Malaya just before and during WW2. HMS Valiant was one of the Queen Elizabeth class battleships belonging to the British Royal Navy. She was launched on 4 November 1914 and completed in February 1916. Therefore, Valiant served in both World Wars. 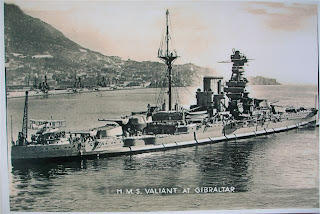 The above postcard photograph shows ‘Valiant’ in Gibraltar sometime in the 1930s. I found this postcard of the vessel in Gibraltar on behalf of Mr James (‘Jimmy’) Campbell of Whitehaven, Cumbria, who served for a short time on ‘Valiant’ during WW2 after having previously served on a sister ship, ‘Malaya’.